On Tuesday, Aug. 27, the list of Russian nongovernmental organizations slated to receive presidential grants was announced. RBTH talked to experts to find out how the choice was made. In total, 1,087 out of a total of 5,655 grant applications were approved, compared to a mere 64 last year. Meanwhile, the total amount the president earmarked for NGO grants this year has hardly changed since last year. If we consider the list of grants, most of them were extended to regional organizations; even some nationwide organizations received money for their regional projects. Notably, one widely known and reputable nongovernmental organization — the Golos Association committed to monitoring the election system — was left out altogether. The Moscow Helsinki Group (MHG) and the For Human Rights organization won only one grant each, with two of their ongoing projects left stranded. The Agora Human Rights Association received a grant of 1.3 million rubles ($39,000) for a project in Tatarstan that protects victims of abuse by authorities. The Memorial Human Rights Center was allotted 1.3 million rubles ($39,000) for its quarterly reports, “Situation in the North Caucasus: A Human Rights Perspective,” and another 6 million rubles ($180,000) for its rehabilitation program for victims of political repressions. The center even managed to obtain a grant of 500,000 rubles ($15,000) for a project in Ivanovo Region. The Committees of Soldiers' Mothers and the Russian Red Cross received a few minor grants in a number of regions. Meanwhile, the largest amount — 15 million rubles ($451,000) — was awarded to a research center under the Russian Academy of Sciences and Moscow State University, which is set to create an online museum of the Russian Constitution in anticipation of the constitution's 20th anniversary. Opposition NGOs — some of which were even invited to register as foreign agents with the Ministry of Justice — had mixed feelings about the grant competition results, Kommersant reported. MHG leader Lyudmila Alekseyeva said she was ready to auction off her personal collection of Gzhel ceramics to keep important projects running. The human rights activist also added that she was planning to seek funding within Russia. Looking for money inside Russia is a very important remark since. Once a political project receives foreign funding, the NGO will have to file for “foreign agent” status — a move to which all human rights activists are averse. State Duma Speaker Sergei Naryshkin recently announced that the law on foreign agents could be revised to redefine “political activities,” in order to make NGOs more efficient. The Golos Association is one of those labeled a “foreign agent” by law enforcement authorities, although the organization has not acknowledged this status. 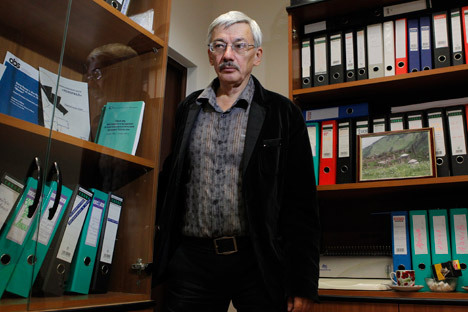 As Sergei Markov, the director of the Institute for Political Research, told RBTH, the conflict eventually prevented the organization from receiving grants. “It was decided that all NGOs, including ‘foreign agents,’ were eligible for grants, unless the NGO was declared a ‘foreign agent’ but avoided registration, this making it ineligible. This is precisely what Golos came up against,” the political expert said. Meanwhile, Nikolai Svanidze, a member of the Civic Chamber of the Russian Federation, is positive that Golos should have been granted money because of its weight. “The Golos Association is monitoring election integrity and transparency. It needs the grant to keep it from seeking money abroad and being viewed as a foreign agent,” said Svanidze. According to Markov, the system of government grants is fairly simple and objective. “Grants are awarded subject to several criteria. First, all applications are assessed on the basis of a few parameters, such as project relevance and viability, the organization’s experience in the field and the feasibility of its budget. Projects are graded on a scale of one to five. The applications are then considered by an expert group, which also assigns grades. The points are then added up and the top performers are extended grants,” he said. Markov also added that the entire budget was divided equally between nationwide and regional projects. While local initiatives requested smaller amounts compared to federal projects, the resulting impression was that regional projects were granted more money. “Sociological projects took up a lot of grants, and public initiatives where people sought to resolve problems themselves were also a top priority,” said Markov.